OUR HANDPRINTED Italian tumbled marble tiles create an old world look and feel. Each tile is quarried, cut, and tumbled in Europe from the highest quality marble. We have a selection of three styles for you to choose from that depict our wine labels. 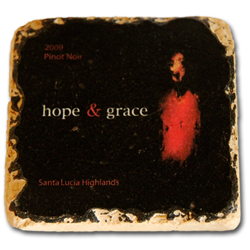 Our hope & grace wines label coaster/tiles vintage changes each year.These beautiful coasters/tiles are a wonderful momento that will be enjoyed for years to come!